This free, printable reprint permission form is to be used when reusing an article, story or photograph from its original source. 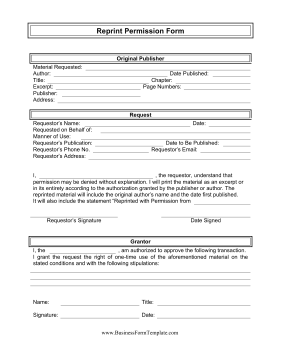 The request must be filled out and agreed to by the original publisher before using the material. I, _____, the requestor, understand that permission may be denied without explanation. I will print the material as an excerpt or in its entirety according to the authorization granted by the publisher or author. The reprinted material will include the original author's name and the date first published. It will also include the statement "Reprinted with Permission from _____."